Intern at Large Karli Hendrickson just wrote me about a fantastic book she's reading: "Off the Wall, Wonderful Wall Coverings of the Twentieth Century" by Lena Lencek and Gideon Bosker. In the second section of this book "Circles and Squares- Geometrics, Abstracts, Op Art, Minimalist Art" the book explains that geometric motifs were typical of the 1950's. 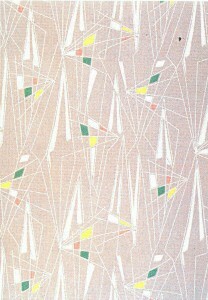 Post World War II, low-cost screen printing inspired the production of more experimental and avant-garde patterns. Also during this time, an upwelling of ranch homes in the growing suburbs inspired the wallpaper industry to create bold patterns wallpaper to accent and jazz up the simple, open, and modern design of these ranch houses. Textile designs at this time were also very bold and featured prisms, grids, doodles, and loops of geometric inspired design.